The Omnivore's Dilemma: A Natural History of Four Meals is a nonfiction book written by American author Michael Pollan published in 2006. In the book, Pollan asks the seemingly straightforward question of what we should have for dinner. As omnivores, the most unselective eaters, humans are faced with a wide variety of food choices, resulting in a dilemma. Pollan suggests that, prior to modern food preservation and transportation technologies, this particular dilemma was resolved primarily through cultural influences. Technologies have recreated the dilemma by making available foods that were previously seasonal or regional. The relationship between food and society, once moderated by culture, now finds itself confused. To learn more about those choices, Pollan follows each of the food chains that sustain us; industrial food, organic food, and food we forage ourselves; from the source to a final meal, and in the process writes a critique of the American way of eating. Noting that corn is the most heavily subsidized U.S. crop, Pollan posits that it has successfully changed the diets in the U.S. of both humans and animals. In the first section, he monitors the development of a calf from a pasture in South Dakota, through its stay on a Kansas feedlot, to its end. The author highlights that of everything feedlot cows eat, the most destructive is corn, which tends to damage their livers. Corn-fed cows become sick as a matter of course, a fact accepted by the industry as a cost of doing business. In the second section, Pollan describes the large-scale farms and food-processing outfits that largely satisfy surging demand for organic food, using Whole Foods as a proxy. The author aims to demonstrate that, despite the group's rhetoric, the virtues on sale often prove questionable. The "free-range" chicken on offer, it turns out, hails from a confinement operation with a tiny yard, largely unused by the short-lived birds. Pollan also accuses large-scale organic agriculture of "floating on a sinking sea of petroleum" by analysing that a one-pound box of California-produced organic lettuce – that contains 80 food calories – requires 4,600 calories of fossil fuel to process and ship to the East Coast. He adds that the figure would be only "about 4 percent higher if the salad were grown conventionally". One of Pollan's major arguments about the organic farming industry is that it creates an unrealistic pastoral narrative, giving people the false idea that, by definition, organic products come from picturesque open pastures. In contrast to his discussion of the large-scale organic food industry, Pollan presents in the third section Joel Salatin, a farmer who runs a successful mid-sized, multi-species meat farm in Virginia, and insists on selling his goods close by and on relying on his family and a few interns to supplement his labor. Pollan discusses how each part of the farm directly helps the others—the sun feeds the grass, the grass feed the cows, the larvae in the cow manure feed the chicken, and the chicken feed the grass with nitrogen. It's all a cycle and the farm doesn't require any or much fossil fuel injection. The final section finds Pollan attempting to prepare a meal using only ingredients he has hunted, gathered, or grown himself. He recruits assistance from local foodies, who teach him to hunt feral pigs, gather wild mushrooms, and search for abalone. He also makes a salad of greens from his own garden, bakes sourdough bread using wild yeast, and prepares a dessert from cherries picked in his neighborhood. Pollan concludes that the fast food meal and the hunter-gatherer meal are "equally unreal and equally unsustainable". He believes that if we were once again aware of the source of our food – what it was, where it came from, how it traveled to reach us, and its true cost – we would see that we "eat by the grace of nature, not industry". Pollan argues that to "give up" human consumption of animals would lead to a "food chain…even more dependent than it already is on fossil fuels and chemical fertilizers since food would need to travel even farther and fertility—in the form of manures—would be in short supply". Given that, according to Pollan, other than raising ruminants for human consumption, no viable alternatives exist in such grassy areas, for growing any grains or other plant foods for human consumption. Economist Tyler Cowen argued, "The problems with Pollan's 'self-financed' meal reflect the major shortcoming of the book: He focuses on what is before his eyes but neglects the macro perspective of the economist. He wants to make the costs of various foods transparent, but this is an unattainable ideal, given the interconnectedness of markets." Washington State University, situated in an agricultural area of Washington state, chose this book to be part of its freshman reading program in 2009 but soon canceled the program. Many in the university's community, including those who run the kinds of industrial farms The Omnivore's Dilemma discusses, were unhappy with the selection, and speculation[by whom?] was that the cancellation was a result of political pressure. Elson Floyd, president of WSU, claimed instead that it was a budgetary issue, and when food safety expert Bill Marler stepped up to cover the claimed shortfall, the program was reinstated, and Pollan was invited to speak on campus. One of Pollan's major arguments about the organic farming industry is that it creates an unrealistic pastoral narrative, giving people the false idea that, by definition, organic products come from picturesque open pastures. Critics of Pollan have argued that he perpetuates a similar false narrative by holding up Joel Salatin's farm as a model and by advocating eating only food from local producers. Salatin's farm has been controversial because he does not place an emphasis on animal rights, while eating only local food can also be harmful to the environment. Studies have shown that the locavorism Pollan advocates is not necessarily beneficial to the environment. As an example, a study by Lincoln University showed that raising sheep, apples, and dairy in the United Kingdom resulted in higher carbon dioxide emissions than importing those products from New Zealand to the UK. Critics have claimed that the cost of food production, including importing feed for animals and disruption to the energy efficiency of the ecosystem, can be more harmful to ecosystems than simply importing food. Some critics have also argued that simply cutting out meat itself would be much less energy intensive than locavorism. 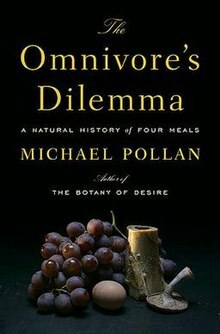 The New York Times named The Omnivore's Dilemma one of the ten best books of 2006, Additionally, Pollan received a James Beard Award for the work. The book has also been published in a young reader's edition, and it is being used in cross curricular lessons by teachers interested in promoting its message. ^ a b c Pollan, Michael (2006). The Omnivore's Dilemma : A Natural History of Four Meals. Penguin Books. ^ Cowen, Tyler (1 November 2006). "Can You Really Save the Planet at the Dinner Table?". Slate. The Washington Post Company. Retrieved 18 May 2009. ^ "College Discourse Over Food Safety, Courtesy of Bainbridge Lawyer". kitsapsun.com. August 29, 2009. ^ Tidwell, Mike. "The Low-Carbon Diet". Retrieved April 1, 2010. ^ "The 10 Best Books of 2006". The New York Times. December 12, 2006. .
^ "Writing on Food, Winner". jamesbeard.org. ^ Pollan, Michael. The Omnivore's Dilemma: Young Readers Edition. ISBN 0803735006. The Omnivore's Dilemma, from Michael Pollan website.